NEW YORK (CNNMoney) -- U.S. stocks rallied Friday, as investors cheered a much stronger-than-expected jobs report. The Dow Jones industrial average (INDU) gained 157 points, or 1.2%, the S&P 500 (SPX) added 19 points, or 1.5%, and the Nasdaq composite (COMP) increased 46 points, or 1.6%. 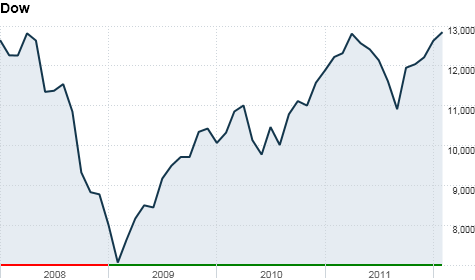 The rally pushed pushed the Dow, up more than 5% in 2012, to its highest level since May 2008. The Nasdaq, up more than 11% for the year, climbed to its highest level since December 2000. The S&P 500 has gained almost 7% this year, and finished at a six-month high. The rally was sparked by the Labor Department's monthly jobs report, which showed that the U.S. economy added 243,000 jobs in January, far exceeding expectations. The unemployment rate dropped to 8.3%, the lowest since February 2009. Economists surveyed by CNNMoney had expected the government to report an increase of just 130,000 jobs in January. The unemployment rate was expected to rise to 8.6%. Economists had expected a slowdown in post-holiday hiring, considering that about 40,000 temporary couriers were hired for the holidays alone..
"The jobs data blew away market expectations," noted Marc Chandler, global head of currency strategy at Brown Brothers Harriman, calling it a "monster" jobs report. "This coupled with other recent reports for January, show the year has begun off on a firm note," he added. Meanwhile, investors were also on the lookout for an official agreement on a debt-reduction plan and a second bailout for Greece. The deal is expected to be near, but negotiations are likely to continue thorough the weekend. U.S. stocks ended mixed Thursday as investors digested a cautious economic outlook from the chairman of the Federal Reserve. Economy: Factory orders for December rose 1.1%, slightly below expectations. The January installment of the ISM Services Index hit 56.8, surpassing economists' expectations for 53.1, and up sharply from the prior month. Companies: Financial stocks were big gainers in Friday's rally, with Bank of America's (BAC, Fortune 500) 5% spike leading the Dow's gains. Morgan Stanley (MS, Fortune 500), Citigroup (C, Fortune 500) and Goldman Sachs (GS, Fortune 500) were all up between 3% and 5%. Shares of Genworth Financial (GNW, Fortune 500) soared 14% after the mortgage insurer swung to a fourth-quarter profit. Tyson Foods (TSN, Fortune 500) shares rose after the company reported better-than-expected earnings and issued slightly upbeat guidance. Estee Lauder (EL, Fortune 500) reported a 15% profit increase for its fiscal second quarter to $597 million, but its stock tumbled as the company's guidance for the current quarter came in short of analyst expectations. Shares of Gilead Sciences (GILD, Fortune 500) spiked after the company posted fourth-quarter earnings that rose almost 6% from a year ago. Edwards Lifesciences' (EW) stock dropped as earnings fell and the company gave a lackluster forecast for the current quarter. Zynga (ZNGA) shares continue to rise, after Facebook's IPO revealed the gamemaker accounted for 12% of its revenue in 2011. Research in Motion (RIMM) shares dipped after the BlackBerry-maker said it will give its tablet, the BlackBerry PlayBook, out to Android developers in exchange for their apps. Trading in shares of Micron Technology (MU, Fortune 500) was halted after the company announced that its CEO and chairman Steve Appleton died Friday morning in a small-plane crash in Boise. Currencies and commodities: The dollar slipped against the euro and the British pound, but rose versus the Japanese yen. Oil for March delivery rose $1.48 to settle at $97.84 a barrel. Gold futures for April delivery fell $19 to settle at $1,736.80 an ounce. Bonds: The price on the benchmark 10-year U.S. Treasury fell, pushing the yield up to 1.95% from 1.82% late Thursday. World markets: European stocks ended sharply higher. Britain's FTSE 100 (UKX) rose 1.8%, while the DAX (DAX) in Germany jumped 1.7% and France's CAC 40 (CAC40) rose 1.5%. Asian markets ended mixed. The Shanghai Composite (SHCOMP) rose 0.8%, while the Hang Seng (HSI) in Hong Kong was flat and Japan's Nikkei (N225) slipped 0.5%.